Viewing time: 5 mins. 41 secs. The Write Question is a weekly video podcast all about writing. 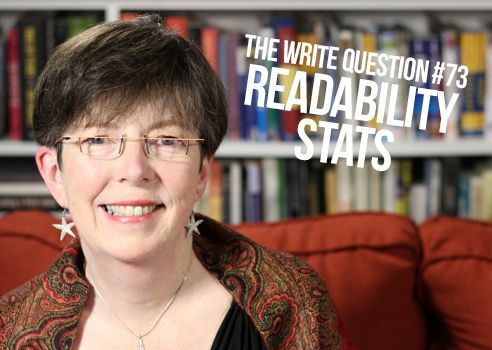 Today’s question focuses on readability stats. If you have a question you’d like me to answer you can email me at daphne@publicationcoach.com, tweet me @pubcoach, or leave a message for me at the Skype account, The Write Question. Welcome to The Write Question, I’m Daphne Gray-Grant and my topic today is understanding readability stats. Today, I have a question from Jim Homme who’s based in Pitsburgh, PA. Here’s what he’s asked. Thanks for your question, Jim. For viewers or readers who are unfamiliar with writing stats — also known as readability stats — let me tell you that this tool is available to everyone in MS Word. The default installation of Word, however, does NOT enable it, so I’ve included a link to a video below, instructing you on how to install it. Anyway, this handy device is something I use every day and I particularly like the “grade level” calculator which is part of it. While all of these indices do the same thing, they all work in slightly different ways. For example, some of them measure length of words based on the number of characters, while others use the number of syllables. So, if you enter exactly the same text into each of these indices you’ll see a slightly different score. MS Word uses the Flesch Kinkaid grade level but if you’d like to see ALL of indices at the same time, I include a link below to Online-Utility.Org. So, which one should you believe? I think you should look at the RANGE, from lowest to highest. For programmers like you, Jim and for the engineers and academics with whom I often work, I think the single best measurement to focus on is sentence length. Many people write too many sentences that are too long. But, also remember that you don’t want every sentence to be short. If you do that, your text might end up sounding like a grade school reader: “See Jane pat the dog, Spot.” Instead, what you want is a wide range of sentence lengths with an average length of somewhere between 14 and 18 words. Does that sound too short to you? You may or may not be a fan of author J.K. Rowling but you won’t likely regard her style as overly simplistic. Yet her average sentence length is 12. I’ve written a detailed post on how to achieve a better sentence length and I include a link to that below. I also provide a link to Count Wordsworth, a free app that, among other jobs, will provide you with a sentence length analysis. Now, let’s talk about grade level. The indices use their core measurements — word length, sentence length, paragraph length and amount of passive — to assign a grade level to every piece of writing. You might think that the higher the better but this is NOT true. Instead, you want to aim at a grade 9 level. This means that your writing is clear and easy to read, regardless of the education level of your reader. It is not an insult to your readers to write to a grade 9 level. This is the level that most publications, including the New York Times will aim for. If your grade level is too high then simply use shorter words, shorter sentences, shorter paragraphs and less passive. All of these actions will help reduce your grade level. Thanks for the question, Jim. If you’re able to aim at a grade 9 writing level, your readers will thank you and they’ll have a much easier time understanding your text.